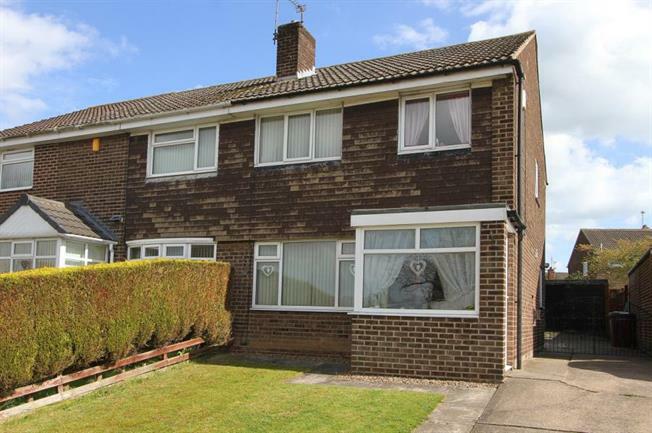 3 Bedroom Semi Detached House For Sale in Sheffield for Guide Price £160,000. Superb three bedroom semi detached in Killamarsh, occupying a sought after Cul-de-sac location the property boasts stylish decor throughout, Garage and a uPVC Conservatory to the rear. In brief the accommodation comprises; To the ground floor the Entrance door leads to the Porch and in turn through to the hallway. The Living room has a feature fireplace with living flame gas fire, under stair storage cupboard and is open plan through to the Dining Room having laminate to the floor, then to the modern fitted Kitchen with integrated appliances to include gas hob, electric oven and extractor fan, the uPVC Conservatory provides great family space, also having laminate to the floor and is accessed off the living room. To the first floor are Three bedrooms, the master bedroom having built in double wardrobes, double bedroom two overlooking the rear garden and housing the airing cupboard, bedroom three with built in storage cupboard and the family bathroom benefits from a three piece suite in white comprising: wash hand basin, low flush wc and bath with electric shower above. The property stands in well maintained gardens and has a driveway leading to the detached Garage. To the rear is a fully enclosed garden with patio area. Situated in the popular area of Killamarsh ideally placed for a host of superb local shops, schools and amenities, the village boasts a leisure centre and further cricket club with Rother Valley Country Park on the doorstep offering a host of leisure facilities and fishing ponds. Nearby Crystal Peaks Shopping Centre, Sheffield Supertram and superb local walks on the Pennine Trail are also part of the popularity of the area. Ideally placed for M1 motorway networks and links to Sheffield City Centre.